With its extensive notes, commentary, and cross-references, the NABRE will promote a deeper love and understanding of Scripture in the home, parish and school. In addition to its wealth of study material, each Saint Benedict Press NABRE features a 3-year liturgical cycle of Sunday readings, a 2-year liturgical cycle of daily Mass readings, a listing of Popes, and a manual of favorite Catholic prayers. Features include: elegant-readable typesetting, gilded page edges, beautiful Old Masters art and full color maps, presentation and family record sections. I could not be happier with the quality and beauty of this bible. It's the perfect size to carry around and I absolutely adore the soft red cover and gilded edges. I thought that there would be more colored images like description said, but honestly it doesn't make me any less satisfied with my purchase. It would be the perfect gift for any confirmation, wedding, or special occasion, or just because. When I originally reviewed the bible I purchased, I was critical of the way the personalization was done and thought it had been done incorrectly. I received a call today from a Customer Service representative explaining that in the particular script I chose that what was printed on the front of the bible was correct because of the script type. Purchased two burgundy engraved Bibles for my two son's Confirmation. Received early which was wonderful and was delighted to see the quality of the Bibles and the engraving. They are just beautiful. Not as many color pictures or maps as the description makes it sound like it will have, so we are a little disappointed. 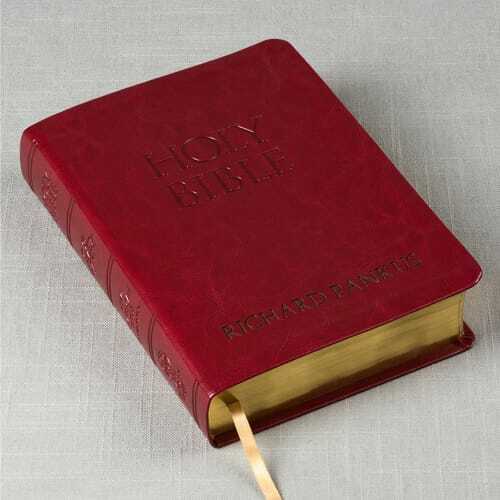 Other than that, it is a nice quality Bible and the laser engraving looks great. Very happy with quality and personalization on cover! Purchased two Bibles as gifts for my son and daughter. Had both personalized with their names on the cover. Beautiful Bible and the engraving is top-notch. Appreciate the variety of fonts to choose from. Good quality, personalization was well done... will be confirmation gift. This is a beautiful soft covered Bible. Very nice!!! Excellent quality. I purchased this Bible as a Confirmation gift and had it engraved. It came in a timely fashion and the engraving was beautiful. Bible includes nice color pictures in the back, and wonderful maps. Would highly recommend this as a gift!